Lower-extremity venous insufficiency is a common condition, associated with considerable health care costs. Endovenous laser ablation is increasingly used as therapy, but its mechanism of action is insufficiently understood. Here, direct absorption of the laser light, collapsing steam bubbles and direct fiber-wall contact have all been mentioned as contributing mechanisms. Because fiber tips have reported temperatures of 800–1,300°C during endovenous laser ablation, we sought to assess whether heat conduction from the hot tip could cause irreversible thermal injury to the venous wall. We approximated the hot fiber tip as a sphere with diameter equal to the fiber diameter, having a steady state temperature of 800°C or 1,000°C. We computed venous wall temperatures due to heat conduction from this hot sphere, varying the pullback velocity of the fiber and the diameter of the vein. Venous wall temperatures corresponding to irreversible injury resulted for a 3 mm diameter vein and pullback velocities <3 mm/s but not for 5 mm and ≥1 mm/s. The highest wall temperature corresponded to the position on the wall closest to the fiber tip, hence it moves longitudinally in parallel with the moving fiber tip. We concluded that heat conduction from the hot fiber tip is a contributing mechanism in endovenous laser ablation. Chronic venous insufficiency has a great impact on the quality of life of patients and is associated with considerable health care costs (up to 1% of total budget) . This common medical condition is now increasingly being treated by minimally invasive endovenous laser ablation (EVLA) because of excellent outcomes and low rates of complications and recurrences . Although EVLA has demonstrated occlusion rates of 90% or more after several years of follow up studies [3, 4, 5, 6, 7], multiple laser wavelengths, laser powers and pullback velocities are currently in use. Most likely, this wide variation of commercially introduced laser parameters is a consequence of the current uncertainty in the mechanism of action of EVLA. Despite consensus on the requirement of a thermally injured venous wall, the uncertainty relates to the mechanism or mechanisms that cause the thermal injury. Here, direct absorption of the scattered laser light by the venous wall [8, 9], steam bubble generation at the fiber tip and their subsequent propagation to, and distal collapse at, the wall [10, 11], and direct contact of the fiber tip with the wall , have been suggested as contributing mechanisms. Notably, however, exceedingly high temperatures of the fiber tip during laser irradiation in blood have also been reported, at 810 nm [9, 13], 980 nm , and 1,064 nm . For a wavelength of 1,320 nm, such information is not available; however, the recent description of a serious complication  strongly supports the conclusion that very high temperatures had occurred. Briefly, an EVLA at 1,320 nm caused perforation of the right ventricle of the patient’s heart by a 6 cm end of the catheter, identified because of therapy-resistant cardiac arrhythmia and subsequent removal by a thoracic surgeon. The treating physician’s hypothesis was that the laser tip had been erroneously located inside—rather than outside—the catheter and that laser activation had explosively disconnected the tip of the catheter distal to the position of the fiber tip. Explosive disconnection was confirmed in an in vitro experiment in blood, but not in saline solution . Because the hot fiber tip has not been considered as a contributing mechanism in EVLA, we sought to evaluate whether heat conduction from the hot tip could cause irreversible thermal injury of the venous wall. Laser irradiation through a fiber held in blood causes the temperature of the laser tip to increase rapidly to temperatures of 800–1,300°C [9, 10, 12, 13, 14]. These high temperatures sometimes cause melting of the tip . Such temperatures cause the generation of steam bubbles. These bubbles propagate towards the venous wall for several seconds, opposite to the direction of fiber pullback, and collapse at the wall, centimeters distal to the tip. Further, such high temperatures also cause carbonization and even perforation of the venous wall when the fiber tip touches the wall [9, 10, 11, 12, 14]. Thus, four mechanisms potentially contribute to EVLA efficacy. 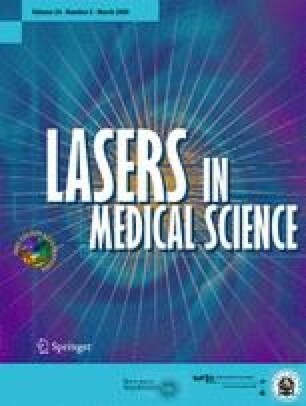 First, direct absorption of the laser light transmitted through the fiber tip, scattered by the blood and reaching the venous wall, which was previously discussed by Mordon and colleagues . Second, heat diffusion from the hot fiber tip towards the venous wall, which consequences have not been considered so far. Third, steam bubbles propagating away from the fiber tip and subsequently collapsing at the venous wall. And, fourth, direct contact between the hot tip and the wall. In this paper we focus on the second mechanism of heat conduction from the hot fiber tip and show that it leads to irreversible injury of the (peri)venous wall at typical pullback velocities and vein diameters following tumescent anesthesia. In the situation of a moving fiber tip with a pullback velocity of v mm/s, distance R is time dependent. At t = 0, we used the notion that the fiber tip starts at distance L0 cm from point A (Fig. 1). Further, because the vessel wall now experiences a spatial–temporal varying temperature, heat conduction along the vessel wall takes place as well. However, because the time constant for heat conduction is quite long, estimated to be approximately 80 s (see Appendix), we neglected axial heat conduction along the vessel wall for this analysis. Figure 2 shows some results for κ = 1.4 × 10−7 m2/s, a typical value for blood , a = 0.2 mm, i.e., taken as equal to the radius of the fiber, L0 = 1 cm, V = 1,073 K (800°C) or 1,273 K (1,000°C), a venous radius of r = 1.5 mm (assuming that the diameter of the treated vein is the diameter of the catheter, in our case 3 mm, caused by the tumescent anesthesia that increases the perivenous pressure), but also 2.5 mm (Fig. 3), the vein radius used in the experiments by Disselhoff et al. , and close to the tube radius of 3 mm used by Proebstle et al. , and v = 1 mm/s, 2 mm/s, and 3 mm/s. As an example (Fig. 2), at a velocity of v = 1 mm/s it takes 10 s for the fiber tip to propagate from the 1 cm starting distance to reach the minimum radial distance to point A, causing the maximum wall temperature at point A to be reached. For larger pullback velocities, the time period that the hot sphere is closest to point A becomes increasingly shorter; thus, the maximum temperature becomes increasingly lower. This mathematical model confirms the suggestion that the heat of the hot tip that diffuses to the vessel wall is sufficient to cause irreversible injury of the (peri)venous wall, reaching temperatures up to and above 70°C, provided that both the radial distance between fiber and wall and the pullback velocity are not too large (Figs. 2 and 3). It also suggests that the actual temperature of the hot tip is not very critical, provided sufficient laser power is used to reach at least 800°C. We have shown that heat conduction from a very hot tip kept in the center of the vein with realistic temperatures of 800–1,200°C causes irreversible injury of the venous wall under typical EVLA clinical conditions. These exceedingly high temperatures have been measured, or estimated, based on impressive events such as melting of the fiber tip  or explosive removal of the distal end of a catheter  and comprise the wavelength range of 810–1,320 nm. Although no information is currently available for wavelengths of 1,450 nm, we hypothesize that similar high temperatures are likely to occur, although at lower laser powers, based on the higher blood absorption coefficient (a factor of more than 10 higher than that at 1,320 nm ). Importantly, this mechanism achieves the highest wall temperature at the shortest distance between tip and wall (Figs. 2 and, 3), thus in radial direction perpendicular to the (moving) fiber tip. In contrast, steam bubbles generated at the hot tip move opposite to the direction of fiber pullback over a distance of centimeters before collapsing at the venous wall (personal observation). Importantly, therefore, the moving bubbles do not interfere with radial heat conduction, and, in addition, the moment that steam bubbles collapse against the wall is significantly delayed (seconds) when compared with the moment of maximum venous wall temperature by heat conduction. In addition, the rate of steam bubble condensation is proportional to the temperature difference between the steam content of the bubble and the environment, and the significantly elevated wall temperature for a duration of seconds (Figs. 2 and 3) may explain the rather long life time of these bubbles (Dr. Cees W.M. van der Geld, Faculty of Mechanical Engineering, Eindhoven University of Technology, personal communication). Consequently, steam bubbles may be of secondary importance for EVLA efficacy. Nevertheless, it cannot be excluded that they are another contributing EVLA mechanism. Although Mordon et al. , Disselhoff et al. and Fan and Anderson  provided arguments against the thermal efficacy of steam bubbles, the further unraveling of the complex mechanisms of EVLA calls for identification of the thermal consequences of propagating and collapsing steam bubbles, a project in progress in our group. Direct contact between vein wall and hot fiber tip certainly occurs, proposed to cause wall perforations and showing as carbonized particles on the wall, as was clearly demonstrated by, e.g., Disselhoff et al. , Meissner et al. , Proebstle et al. and Weiss . It was recently proposed as the primary mechanism of action by Fan and Anderson . Nevertheless, we hypothesized that accidental contact alone cannot produce sufficient wall damage for subsequent closure of the total length of the vein. However, some clinicians include manual compression of the vein during laser therapy stimulating the draining of blood out of the vein as well as direct contact between fiber tip and venous wall. In such cases it is unclear whether enough blood is present to produce severe heating of the tip, and, also, direct interaction of the wall with the laser light may occur to a larger extent than without compression. In any case, our model was not intended to describe such procedures. The mechanism of heat conduction explains why saline solution-filled vessels only showed injury at sites of direct laser light versus wall impact, whereas a homogeneously injured wall occurred in blood-filled vessels now caused by heat conduction from the very hot tip . Our results in Fig. 3 imply that a vein radius of 2.5 mm and a pullback velocity of 2 mm/s, the experimental conditions used by Disselhoff et al., would produce insufficient temperatures at the vein wall, reproducing their observation that “the diffusion of heat into the surrounding tissue was minimal” . Laser power may be less critical, provided it is sufficient to reach tip temperatures of at least 800°C (Fig. 2). Unfortunately, however, the relation between laser power and resulting steady state tip temperature and to what extent tip blackening is involved [9, 10, 12] is currently incompletely understood. In conclusion, heat conduction from the very hot fiber tip causes thermal injury of the venous wall under typical clinical conditions of pullback velocities and vein diameters. This mechanism thus is another contributing factor in EVLA. Steam bubbles moving away from the fiber tip have a delayed distal impact on the venous wall, implying that their potential efficacy may be secondary to the mechanism of heat conduction from the hot tip. Here, x0 is the width of the temperature profile along the vessel wall axis. This estimate implies that the temperature profile in the x-direction is approximated by a cosine function, i.e., cos[(π/2)(x/x0)]. From Fig. 2, we have x0 ≈ 6 mm, and with κ ≈ 1.8 × 10−7 m2/s, we find τ ≈ 80 s.